As a populist, Nigel Farage likes to describe and think of himself as a champion of the people, of the regular guy on Main Street. Like every other populist, his natural enemies are “the elites;” a treacherous and deceitful species. Their Olympus is far away from average Joe, in Brussels, there they discuss how they can strip Joe of his freedom of polluting the planet and turning it into a huge oven. There they scheme the laws, which Joe hates, to regulate for example freedoms of transport, which Joe actually loves when the summer vacations come. As a populist, you are immune of turning into an elitist, even if this is your 19th year on the Olympus. You can support Brexit and thus end your political career as someone who achieved his goal, like Nigel Farage, and then say that you are “the turkey that voted for a Christmas.” A nihilist turkey indeed! A populist remembers – and reminds people, that the elites control the establishment, which is more of a state of mind than a real establishment. You can blame the establishment for every thing that goes wrong in your country, or even in your life: The economy is not doing well, it is the unfair trade deals; criminality is rising, a side effect of globalization; it is immigrants, whom by the way no one likes or wants in your country; your girlfriend has left you, again, you are a victim of globalization. 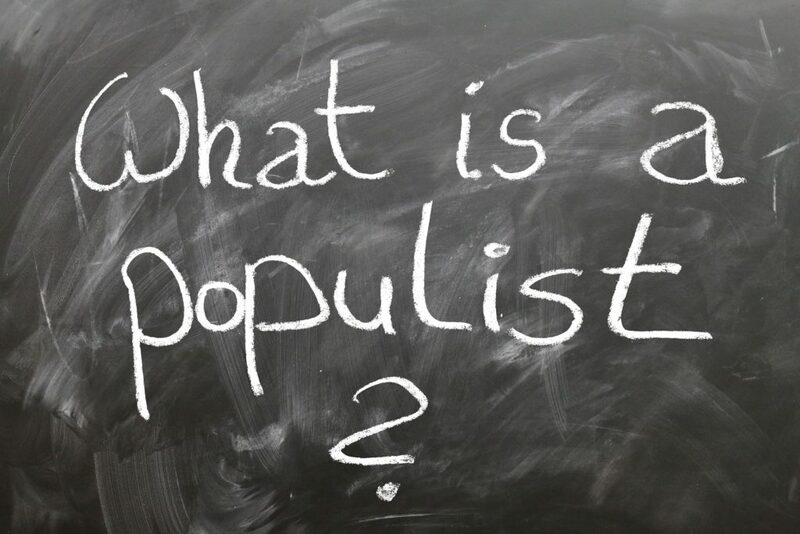 A populist does not necessarily need a big backpack, his dictionary is relatively small. He has however the biggest mouth in the room. After a while he starts to repeat himself, to become a lame parody of himself, always discussing the same issues: immigrants unwilling to integrate, criminal refugees, corrupt elites, rigged establishment, rigged power structures, rigged elections, silent majority (these are important, remember that he claims to represent these people.) More direct democracy will always be preached, without ever applying it to the own party. Demonstrations against the Barbarians at the gates (in English they are called immigrants) are also recommended. Champions of the culture will join the cause with signs and slogans with more spelling mistakes than words. The few words are copied from the aforementioned dictionary. Even though they constantly claim it, populists never take responsibility for the future. Just like every politician claims that they are worried about the next generations. It does not matter that the next generations mostly despise them. For a populist, truth and reality are old-fashioned. Nigel Farage, like almost every other populist, believes that the next European elections are going to be “fun”. The nihilist turkey wishes Christmas for other turkeys too.